I was recently interviewed by Youmna Naufal for ECONEWS magazine by The Chamber of Commerce Industry and Agriculture. A version of the interview below appeared in print in the June 2014 edition. Named the Social Media Consultant of Lebanon, Mohammad Hijazi is a young man who, like many, has mastered the art of social media. In his words, social media is no longer just a tool to communicate or connect with people that we know. Its opportunities have become much wider. People can now get acquainted with professionals in their fields, get exposure for their work, get funding for their start-ups, find jobs and even meet new people with similar interests or hobbies. In Lebanon, there is a thriving community of well-educated and interesting members who are worth connecting with on a professional or personal basis. However, he believes only a portion of the Lebanese are aware and knowledgeable enough about proper ways of using social media to enhance their lives. 1) Why should the Lebanese care about social media? In what way is it helpful? Are most Lebanese aware or knowledgeable enough about social media? Social media is no longer just a tool to communicate or connect with people that we know. Its opportunities have become much wider than that. People can now get acquainted to professionals in their fields, get exposure for their work, get funding for their start-ups, find jobs and even meet new people with similar interests or hobbies. In Lebanon, there is a thriving community of well-educated and interesting members who are worth connecting with on professional or personal basis. However, I believe only the elite of the Lebanese are aware and knowledgeable enough about proper ways of using social media to enhance their lives. I am not saying that only the elite are on social media; on the contrary, the majority are. But they do not know how to use it or are not interested in using it beyond chatting and sharing photos. 2) What do people need to know about social media in Lebanon? Are there courses to take? Who is offering them? What do they teach? Social media is constantly changing day to day. Every week, a new social network is born and people need to keep up. Social media courses are popping up everywhere. Everyone who wants to make a quick buck now offers a social media course, but most of these are not useful as the trainers are not experienced and only offer basics that can be self-acquired. People need to do their research about the trainer and his work in social media before enrolling in classes and spending their money. For senior citizens (above 50 years of age) who are interested in learning about social media, I recommend Social Media for Beginners which is given at AUB (and open for everyone above 50) as part of the University for Seniors. They offer courses such as social media, iPads and smartphones for the older generation who would like to become tech-literate. 3) How are businesses and companies benefiting from social media? what are the tools they are using for marketing? what works in Lebanon and what doesn't? Can you provide examples of companies and how they use social media? Businesses are perhaps the most who benefit from social media as they are using it to market their products and services. As compared to traditional advertising, social media advertising costs 5-10% as much but yields more than a 1000% result and most businesses are starting to realize this and shifting their advertising to online marketing. The most effective social media for business in Lebanon right now is Facebook, with Instagram picking up at second place and Twitter in third. Facebook advertising is the key to get exposure for any product or service that is catered to the masses, while Linkedin works more for professionals or B2B advertising. Once Instagram advertising is launched in the Middle East, I believe it might surpass advertising budgets for Facebook since Instagram is now more appealing that other social networks due to its visual interface. Many companies in Lebanon have tried using Twitter for marketing, but very few succeeded. It is currently being used as a customer service and crisis management medium rather than advertising purposes. Many jumped on the Pinterest bandwagon but this platform proved to have so little interest from the general public (as it has become a niche social network for women, fashion and food) that many brands have abandoned it. As for examples, I wouldn't want to give free advertising to businesses but I would like to point out an NGO that is doing a great job on social media. Donner Sang Compter (DSC) is an NGO that relies on social media to connect blood donors to blood banks, hospitals or even people in desperate need for blood. Most of their communication is done of Facebook, Twitter and Instagram and this has been extremely effective for them. 4) Politicians and entertainers also use social media. How does it benefit them? Who are the most popular ones in Lebanon? Can you name the top 10 most famous social media personalities? Social media has changed the way politicians and entertainers communicate with their audience/fans. Before, traditional media only allowed a one-way communication where the celebrity would say what he/she wants with little or no feedback from the audience. Social media has changed this into a two-way communication where these celebrities engage directly (with no middle-man) with their audience. This gives the celebrity a human feel and gets them closer to their audience. It is hard to say who are the most popular figures online because each source have different criteria of measurement. I will be relying on SocialBakers.com for the latest Facebook figures of LOCAL FANS for several categories. As I mentioned though, these ranking do not necessary mean that these pages are more active or have a better social media presence, but rather a bigger number of local fans on Facebook. 5) As a social media consultant, you've created the Online Collaborative. What purpose does it have? Can you provide background on how the idea came about? My primary day jobs include being a social media consultant for brands and companies and Editor in Chief of a print and online magazine about social media and tech called Cloud 961. However, this does not relate to the Online Collaborative. It is a non-profit zero-salary initiative that aims to promote the proper usage of social media to the Lebanese public (students, children and senior citizens) through workshops, events and conferences. We also aim to be a platform for bloggers and members of the online community to unite and discuss their problems (such as online bullying and lawsuits from brands). In 2010, we founded the Online Collaborative when we saw that there is no entity that groups social media enthusiasts and experienced individuals in the digital media world. It aimed to help promote proper digital citizenship through making the most of social media in the best ways possible. Spanning over 120 members, OC has already organized many successful events and training workshops in Lebanon such as the Social Media Changing Lives conference at AUB in 2011 and 2014, and Blogging Lebanon Conference in 2010. It also actively seeks to provide support to various local and regional events in providing online coverage and community crowd-sourcing. 6) You've also held the Social Media Awards and several conferences attended by many to explain the importance of connecting. What have been the highlights of these events? What can the audience take away? 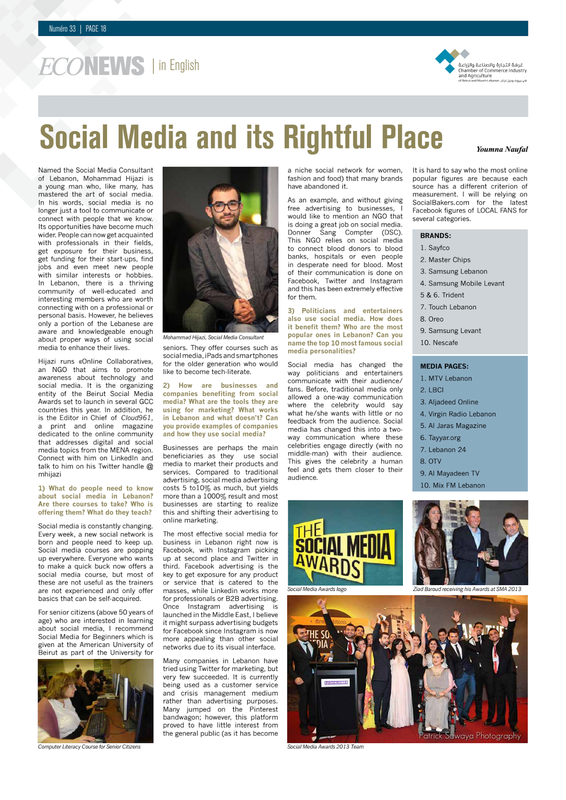 The Social Media Awards is also a non-profit initiative by the Online Collaborative that aims to allows the Lebanese online community to nominate, vote for and award their favorite accounts in the Lebanese social media scene in an attempt to shine a spotlight on the bloggers, journalists, content creators, community managers, public personas, users of social media and celebrities that are doing a great job on social media in hopes that they become role models for others in the community. The audience of the SMAs and other conferences were able to identify the best practices of social media usage and ways they can improve their lives using online media. 7) When readers from abroad read this article, what will they find out about social media in Lebanon that they did not know? How can they connect with the Lebanese? Are the Lebanese abroad and the ones here connecting a lot? I'm not sure if readers realize that Lebanon has a thriving and very active online community that have become trend-setters for the Lebanese and Middle East. Many of the members are constantly approached by brands for their opinions on products and services for example. Additionally, individuals and brands get criticized and bashed all the time. It is easier to criticize because most people don’t realize that at the other side of the screen, there is a living breathing human being that will be affected by their words. If it were an offline conversation, most people will tend to consider the consequences of their words more and try to be diplomatic in order not to hurt the individual they are criticizing. Possibly the most negative aspect of social media is that it eliminates the human aspect from communication and that’s what the online community needs to be aware of. As for the expats, I have noticed that a lot of them like to engage with the residents because it brings them closer to their motherland and keeps them connected and aware about what is going on in Lebanon. A premium example about this is perhaps the most active Lebanese political blog (Beirut Spring) is run by a Lebanese expat (Mustapha Hamaoui) who have lived in Ghana for years!